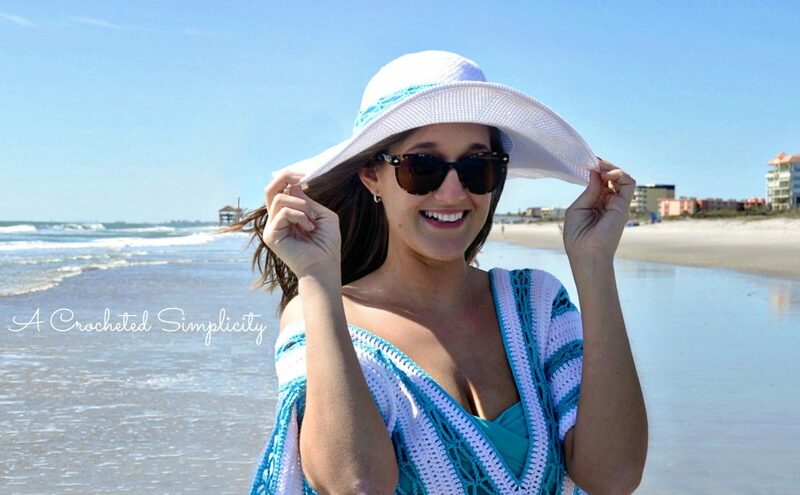 I designed the Beach Day Sunhat to coordinate with Maria’s Beach Day Cover-Up (Click Here for pattern) for the Mother’s Day CAL. This is the 4th pattern in the series. You can find all of the information about the CAL, and the patterns, HERE. 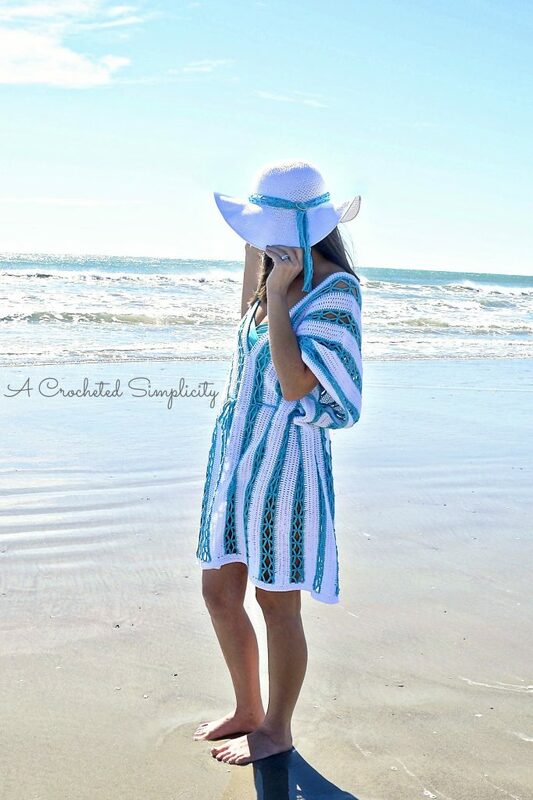 My favorite sunhats have wide, slightly wavy brims so I designed this hat to have a wider, slightly wavy brim. But, if you prefer a more narrow brim, you can easily adjust its width. 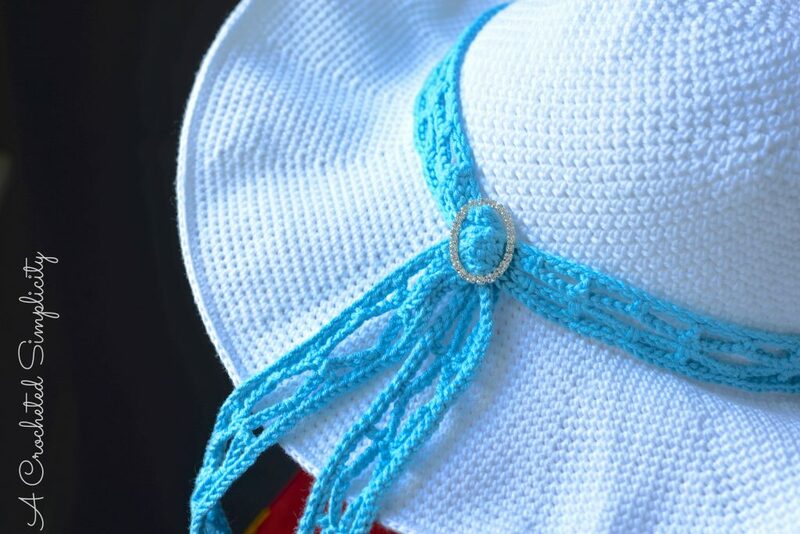 I used Premier Cotton Fair for my sunhat, in Turquoise and White. I’ve worked with this yarn before and loved working with it, especially the fact that for a cotton blend, it didn’t dry my hands out! Cotton Fair is a blend of 52% cotton and 48% acrylic, which makes it perfect for garments and year-round wear. The blend makes it a great cotton yarn to work with as it’s easy on your hands (one of my favorite things about it!). It’s a nice, soft, and smooth yarn with a beautiful sheen and it also creates incredible stitch definition! This yarn comes in a great range of bright solids and multi colors so you are sure to find just the right color for your sunhat. When working in rows, the first stitch of every row is worked into the same stitch as the turning chain. Yarn Notes: Premiere Yarns Cotton Fair (2 balls white / 1 ball turquoise) was used for the sample on page 1. Another comparable #2 sport weight yarn may be used as long as gauge is met. Wire: Millinery wire is suggested for large brim sunhats. I found my wire & joiner on Etsy HERE. Don’t forget the joiner HERE! You can also use other craft wires, but they do not hold their shape like millinery wire does. The listing is for 1-1/2 yards of wire. Don’t want to add wire to your hat? You can also work the brim with a smaller hook. This will tighten up the stitches and stiffen up the brim. The brim will still be wavy, but not droopy. Rnd 7: [ (sc, ch 1, sc) in the next ch-1 sp, ch 1, skip the next st, (sc in the next ch-1 sp, ch 1, skip the next st) 5 times ]work from [ to ] around to last ch-1 sp, skip last ch-1 sp. (56 sts not including skipped ch-1) Begin next round in the ch-1 space you just skipped. Rnd 8: [ (sc, ch 1, sc) in the next ch-1 sp, ch 1, skip the next st, (sc in the next ch-1 sp, ch 1, skip the next st) 6 times ] work from [ to ] around to last ch-1 sp, skip last ch-1 sp. (64 sts not including skipped ch-1) Begin next round in the ch-1 space you just skipped. Rnd 9: [ (sc, ch 1, sc) in the next ch-1 sp, ch 1, skip the next st, (sc in the next ch-1 sp, ch 1, skip the next st) 7 times ] work from [ to ] around to last ch-1 sp, skip last ch-1 sp. (72 sts not including skipped ch-1) Begin next round in the ch-1 space you just skipped. Rnd 10: [ (sc, ch 1, sc) in the next ch-1 sp, ch 1, skip the next st, (sc in the next ch-1 sp, ch 1, skip the next st) 8 times ] work from [ to ] around to last ch-1 sp, skip last ch-1 sp. (80 sts not including skipped ch-1) Begin next round in the ch-1 space you just skipped. Rnd 11: [ (sc, ch 1, sc) in the next ch-1 sp, ch 1, skip the next st, (sc in the next ch-1 sp, ch 1, skip the next st) 9 times ] work from [ to ] around to last ch-1 sp, skip last ch-1 sp. (88 sts not including skipped ch-1) Begin next round in the ch-1 space you just skipped. Rnd 12: [ (sc, ch 1, sc) in the next ch-1 sp, ch 1, skip the next st, (sc in the next ch-1 sp, ch 1, skip the next st) 10 times ] work from [ to ] around to last ch-1 sp, skip last ch-1 sp. (96 sts not including skipped ch-1) Begin next round in the ch-1 space you just skipped. Rnd 13: [ (sc, ch 1, sc) in the next ch-1 sp, ch 1, skip the next st, (sc in the next ch-1 sp, ch 1, skip the next st) 11 times ] work from [ to ] around to last ch-1 sp, skip last ch-1 sp. (104 sts not including skipped ch-1) Begin next round in the ch-1 space you just skipped. Rnds 14 – 15: [ sc in the next ch-1 sp, ch 1, skip the next st ]work from [ to ] around to last ch-1 sp, skip last ch-1 sp. (104 sts not including skipped ch-1) Begin next round in the ch-1 space you just skipped. Rnd 16: [ (sc, ch 1, sc) in the next st, ch 1, skip the next st, (sc in the next st, ch 1, skip the next st) 12 times ]work from [ to ] around to last ch-1 sp, skip last ch-1 sp. (112 sts not including skipped ch-1) Begin next round in the ch-1 space you just skipped. Rnd 17: [ (sc, ch 1, sc) in the next st, ch 1, skip the next st, (sc in the next st, ch 1, skip the next st) 13 times ]work from [ to ] around to last ch-1 sp, skip last ch-1 sp. (120 sts not including skipped ch-1) Begin next round in the ch-1 space you just skipped. Rnds 18 – 19: [ sc in the next ch-1 sp, ch 1, skip the next st ] work from [ to ] around to last ch-1 sp, skip last ch-1 sp. (120 sts not including skipped ch-1) Begin next round in the ch-1 space you just skipped. Rnd 20: [ (sc, ch 1, sc) in the next st, ch 1, skip the next st, (sc in the next st, ch 1, skip the next st) 14 times ]work from [ to ] around to last ch-1 sp, skip last ch-1 sp. (128 sts not including skipped ch-1) Begin next round in the ch-1 space you just skipped. Rnds 21 – 42: [ sc in the next ch-1 sp, ch 1, skip the next st ]work from [ to ] around to last ch-1 sp, skip last ch-1 sp. (128 sts not including skipped ch-1) Begin next round in the ch-1 space you just skipped. *The brim begins in the next round. Do not fasten off. Continue below to Adding Wire. Kathy Lashley from Elk Studio Crafters has a video tutorial on YouTube about adding millinery wire and a joiner to projects. You can watch her video HERE. Adding wire to the brim is pretty simple, but you will find that there is a “sweet spot” of adding too much wire (causing your brim to be really wavy) or too little wire (causing your brim to be really droopy). I prefer a somewhat wavy brim on my sunhats. Fasten off. Weave in ends. Continue below to Lade Tie, if preferred. Row 5: Ch 1, *Working in the FLO*, sl st in every st & ch across, working your last sl st in the top of ch-3 from the beginning ch-7. (271 sl sts) *Note: work the sl sts in this row tighter. If your edge begins to get wavy, go down a hook size to complete the row. Fasten off. Weave in ends. Block, if desired. Continue on to Finishing. Wrap your lace tie around your sunhat, just above the brim. Use a decorative buckle or a nice knot to secure it. You may wish to tack stitch the tie in place every few inches around the circumference of your hat to keep it in place. I made this, and it really is comfortable and effective. Thanks for the pattern! What is meant by “sp” in round 7. Thank you so much for this lovely pattern. You mention keeping to the correct gage but I’m having trouble figuring out what that should be. Any tips? What a pretty sunhat pattern. Such a cute hat, Jennifer! Very smart to add wiring! Premier yarn is crossed out on pattern, are they out of business? Have u ever used the plastic cording for a weed eater instead of the wire and joiner? I’ve heard that it works just as well. All u have to is melt the ends together b4 u crochet around it in the last row. Just curious if anyone else has tried this tip and if it works. Hi, I was just wondering what I was doing wrong between rows 6 and 7…when I’m at the end of row 7 I seem to have an extra stitch left over before starting row 8…I notice that the number of stitches increases by 8 sts but between row 6 and 7 the increase is only 7 sts..from 49 to 56…what am I missing lol. Hi Jennifer, that is what I did and I’m glad it was right…I am just about to start the brim. Wish me luck. I also wanted to thank you for such a beautiful pattern.I can’t wait until it is finished to see what it looks like all completed.